BT832A is a Bluetooth Low Energy, BLE 5 module using Nordic nRF52810 SoC with an integrated PCB trace antenna. Size of module is 14x16x1.9mm. It has 16 castellated pins for applications needing limited number of GPIOs. Additional 24 LGA (Land Grid Array) pins provide access to all nRF52810 GPIO pins. Cortex M4F in BT832 has hardware DSP and floating point instructions. Cortex M4 in BT832A has hardware DSP instructions but it does not have floating point unit to support hardware instruction. Flash/RAM memories in BT832 are 512KB/64KB. They are 192KB/24KB in BT832A. BT832 has NFC tag interface. BT832A does not have NFC tag interface. If your application does not need NFC tag interface, hardware floating point instruction, and 192KB flash/24KB RAM is enough, BT832A can be used instead. Peak current: 5.4 mA RX, 5.3 mA TX at 0 dBm. EV BT832A is preloaded with BlueNor nRF5x application and SoftDevice S132 V5.0.0 Bluetooth 5 stacks. It can be used with Android app BlueNor nrf5x available at Google Play Store. You can send commands from an Android phone to toggle LED light on evaluation board. You can also send button pressing signal from evaluation board to Android device. SDK and Android app source codes are available for download in the Bluetooth 5 Codes section of Download BlueNor Document. Other application codes can be downloaded from the same webpage. 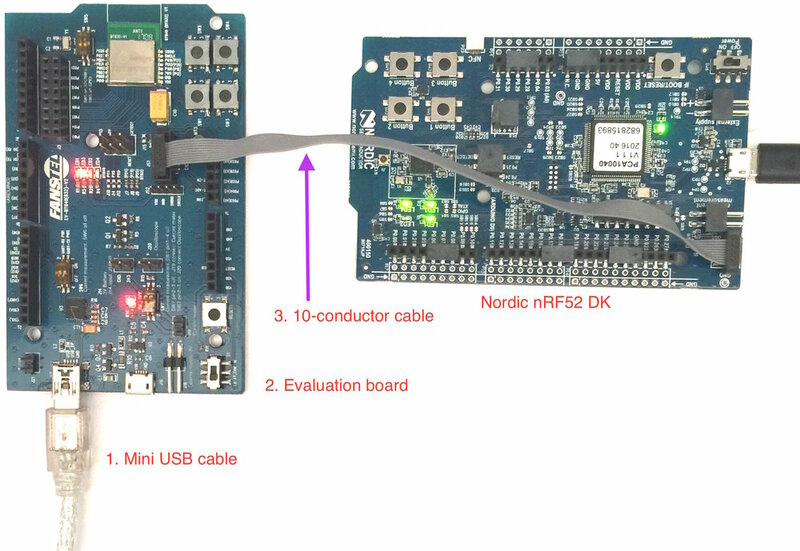 To load other codes or to develop your own, a Nordic nRF52 DK is required but not included. Please contact Fanstel for volume discount and production lead time. BT832A, nRF52810 Bluetooth 5 module for $3.75 special starting at one pcs. Reel quantity (1K pcs), $3.43 each.